Denim is the quintessential, ubiquitous fabric that people love to wear. Yes, many people think of the 1980s when they think of crystals on denim, but there are some very cool ways to update your childhood memories! Swarovski crystals can be applied to denim in many different ways: hot fix, gluing, sewing, and other manual application like rivets. Our Swarovski Application Manual will provide you with a plethora of tips and provide you with plenty of information on how to apply Swarovski crystals. Below are three perfect examples of how different Swarovski crystal products can be used on denim. First is an avant-garde approach using 5 types of Swarovski crystal products: crystal beads, rivets, pearl mesh, arial mesh and crystal fabric. Other than the crystal beads, these products are all available by special order. 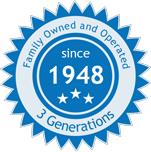 Please contact our offices directly at 1-800-BEADS-NY for more information on any special order item. Denim and fringe have always been a good pair. 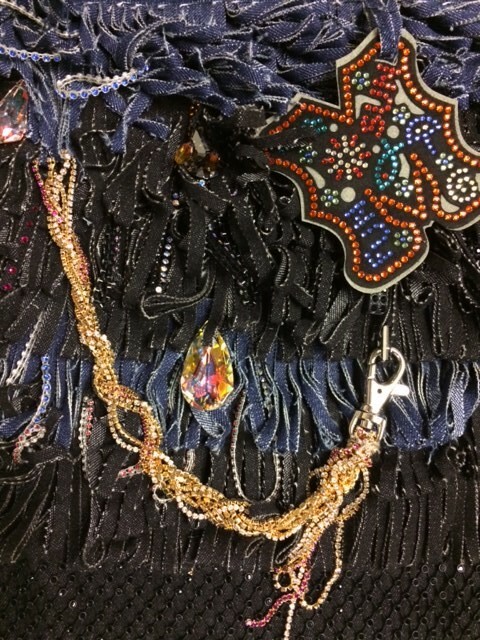 But add Swarovski crystal products to the mix and…”Wowza!” Below is a denim design that incorporates Swarovski transfers, pendants, hot fix rhinestones, rhinestone chain, plastic banding, crystaltex and fishnet banding. Crazy enough for you? Hide a few pendants in the fringe for a special surprise, but definitely make sure that a lot of the crystal makes the wow factor. Incorporate dark colors as a subtle shine against the denim and lighter colors to really get that POP! 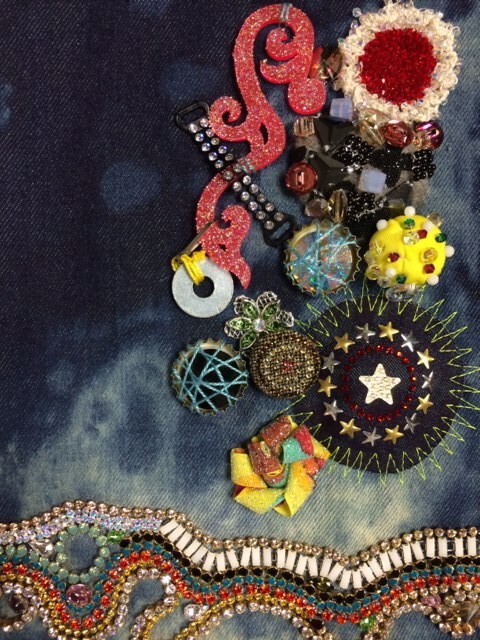 This final denim piece is like a work of art, incorporating many different Swarovski crystal products in a very 3 dimensional way (and details enlarged below). Adding to the 3 dimensionality of the design is that it was done on tie dye denim. 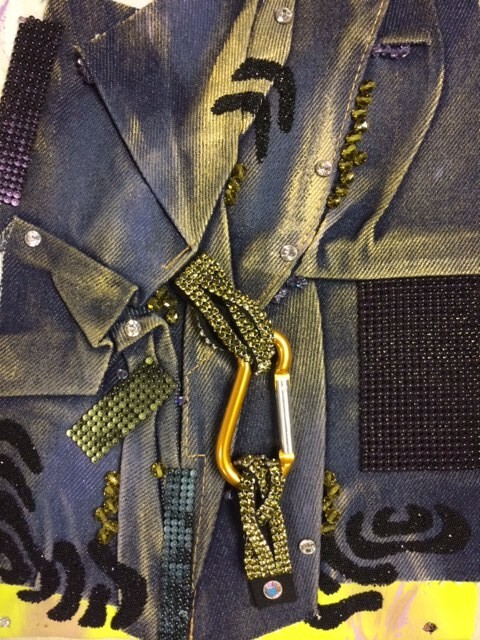 Glued and sewn directly to the denim and also raised on other mediums are: Swarovski transfers, crystal fabric, crystal beads, sew on stones, rhinestone chain, buttons and stones in settings…just to name a few. So, while many might feel limited to using Swarovski flatback rhinestones in their denim designs, we hope these examples show that you don’t need to be. Explore the full line of Swarovski products to incorporate into denim. Your only limitation (other than your imagination) is to make sure the denim is not treated with any waterproof coating. This will prevent any hot fix rhinestones from adhering to the denim. Buy all your Swarovski crystals for your denim designs on our website today: www.harmanbeads.com. As always if you have any questions regarding the application of your design, call us at 1-800-BEADS-NY and we will be happy to help you!